There were 3 posts published on January 22, 2018 (this is page 1 of 1). I’m spending less time at the keyboard lately and more with good old-fashioned low-tech entertainment: a book! 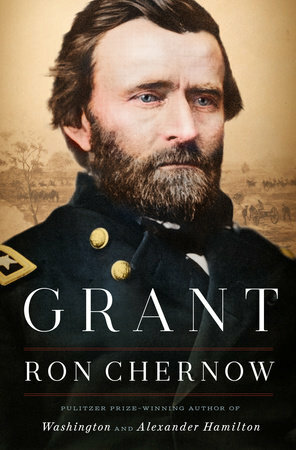 I checked out Grant, Ron Chernow’s biography of Ulysses S. Grant, back in November and have been working my way through this 1,000+ page tome. Yes, it’s way overdue back to the library but I can’t put it down and – good Lord – who can finish a thousand-page book within the skimpy time frame that Wake County Public Library provides its borrowers? I’ll have more to say about the book and Grant when I finish it but so far I like how Grant faced failure after failure in life until the war broke out and he found his place. So, if you wonder why I’m not busier here at the moment, you know I have my nose in a book! Yesterday was my 49th birthday. I spent it being celebrated by my family, catching up on well wishes from Facebook, eating a birthday brunch with Kelly at 18 Seaboard, and going on a fun bike ride with Kelly and Travis down to Lassiter Mill dam and back. A sunny, spring-like day warmed to 65 degrees and rapidly melted away the last piles of snow from last week’s snowfall. As part of my birthday weekend, the whole family and I volunteered for four hours at the nearby Food Bank of Central and Eastern North Carolina, where we sorted potatoes along with about 30 other volunteers. 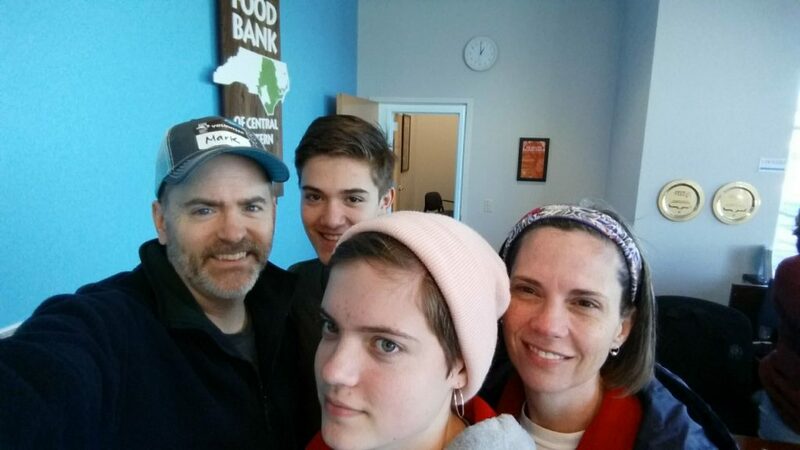 It felt good to help out, and Kelly and the kids enjoyed it, too. Life at 49 is pretty good, I have to say. While my body is starting to show some signs here and there of being ancient, overall I’m in excellent health. I’m loving my family, enjoy my job, and have countless friends near and far whom I’m honored to call friends. While my life isn’t perfect I am learning how to enjoy the things I have and to help others as well. 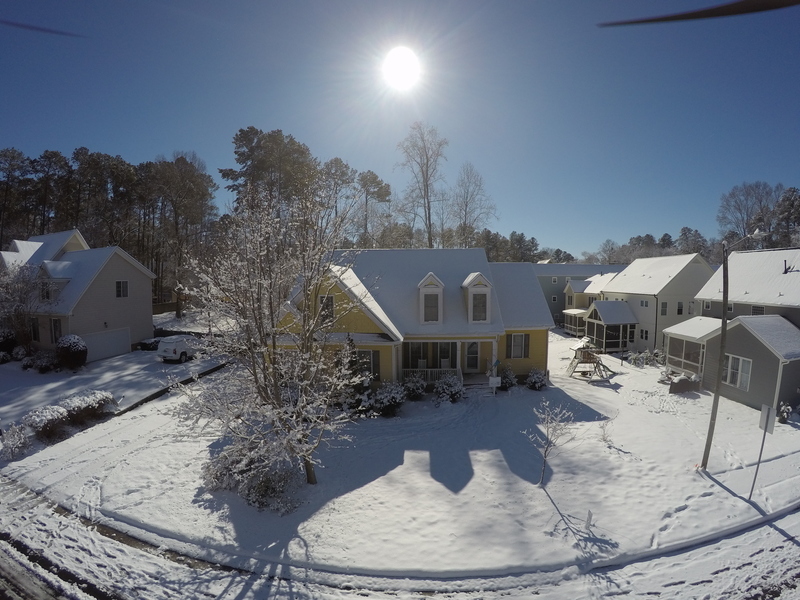 A drone’s eye view of the snow. Last Wednesday morning we got a rather significant snowfall here in Raleigh that kept us out of work and school for the rest of the week. For a while there, it looked as if the heaviest snow would be directly over Raleigh but the fictitious “Raleigh weather dome” (said by equally-fictitious blogger William Needham Findley IV to be controlled by former Raleigh city council member Bonner Gaylord) kept the heaviest snow to the west of us. When it stopped snowing at our home in East Raleigh I had measured 4.75″. I worked from home Wednesday through Friday (ah, the joy of being a knowledge worker) but did enjoy how beautiful the snow looked on the trees. It was a clumping sort of snow that wound up sticking very well to branches but causing few issues with broken limbs. I also caught up on some technical projects I’d been meaning to get done. It was a nice winter event, though when the streets had cleared I was quite ready to go for a bike ride!